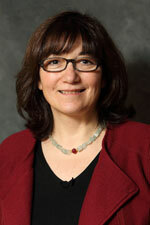 Dr. Eva Kehayia is associate professor at the School of Physical and Occupational Therapy, Faculty of Medicine at McGill University and Scientific co-Director of the Centre for Interdisciplinary Research in Rehabilitation of greater Montreal (CRIR). A neurolinguist and psycholinguist by training she is interested in the study of lexical access and representation, using a variety of methodologies, across different languages, in individuals with acquired and degenerative language disorders, as well as in healthy adults. Over the past 20 years she has been co-leading pan-Canadian initiatives investigating word processing and the Mental Lexicon across languages and populations. Currently, she is co-leading an pan-Canadian Partnership Initiative funded by the Social Sciences and Humanities Research Council entitled: ‘Words in the World’. She is also interested in the study of the impact of language disorders on the individual's everyday life and social participation. Her psycholinguistic and neurolinguistic research is carried out in the Language and Communication Research Lab at the Jewish Rehabilitation Hospital of the CISSS Laval. Dr. Kehayia has been also co-leading with Dr. Bonnie Swaine the Strategic Innovation Project entitled: A rehabilitation living lab: creating enabling environments for social participation and inclusion for individuals with physical, sensory and cognitive disabilities, funded by, Fonds recherche Quebec en Santé. Together with Dr. Swaine she is one of the co-founders of the Fonds Recherche Quebec, Intersectoral Initiative entitled: ‘Towards a more inclusive Quebec society’.